Low Cost or NO Cost Strategies Literally Overnight!" What if you had the chance to take a daring look inside the mind of a crazed marketing genius and discover what really makes him tick? A chance to find the "real" secrets to not only explosive marketing and wealth creation but to true power and success? I have finally discovered exactly how this crazy marketing genius does it all! This man is a true pioneer and is responsible for many "firsts" in Internet marketing strategies and concepts that are light years ahead of their time. But there's something else that I've come to find out about him. I got the interview! And it is one of the most incredible interviews the Internet will ever get to see! I was able to get a special, highly coveted, "no holds barred", full disclosure interview with the man himself -- an encounter that just blew me away! Believe me, this is something you need to get your hands on now! It's the kind of knowledge you simply cannot ignore! You and Allen have an incredible book with "Money And Power." It's one of those ebooks that I printed out and read several times with a marker in hand. Every time that I read it something new that I can - and will - put to immediate use jumps out at me. Allen has an incredible sense of where many aspects of this internet marketing business is headed. His insights into how to best utilize ebooks and reprint rights are priceless. I also gained tremendous appreciation of what it means to be an "Internet Marketing Warrior." I gained a sense of history, pride and inspiration. Allen shared his on-line business experience from the very beginning and then tells where he's headed in the future. Thanks for giving us a very rare and powerful gem." I've read through the interview twice. Could you please limit the number of people reading it? It is a "blueprint for success", I would prefer if the success came my way. I foresee a LOT of successful people springing up all over the net in 2003 just because of this one interview. There are no secrets. Plain and simple." But that's not all. He also revealed something more important and much more powerful than "cutting edge marketing stuff." 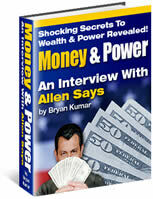 In this mind blowing interview, Allen revealed secrets that can allow you to wield true power! Power over yourself, power over others, and power over everything else in your life! In my 14+ years of studying wealth and power (including information on business, marketing, mind power, self-improvement and success), I have not come across information like this. It is simply mind-blowing! And the best part is, there are no theories or half-baked ideas here. Allen only shares secrets that actually work! Secrets that produce amazing results! Ideas that open you up to new ways of thinking. You won't find this information anywhere else! Because it comes straight from Allen. Through his own studies and tests. I read something on the order of 100 marketing eBooks a year. However, I have never even remotely encountered anything like Money & Power. Allen Says reveals secrets about wealth and prosperity that come only from hard-won knowledge and years of real-life experience as an entrepreneur. Whether you are just starting out or you're an "old hand" at marketing, selling, and starting a business, this book presents a formula for success you may be unfamiliar with; a combination of ethics, honesty, spirituality, and plain old common sense. Just buy it and read it, you'll be glad you did. "Sorry this ebook will not show how to get to the top of the search engines, how to write hypnotic emails, or how to do joint venture deals...but it will give you something even more important! Yes, that's right! You'll discover the philosophy and inside "core" thinking of how to succeed online. The true foundation of how to program your mind to create infinite riches online or off practically at will." This is the "millionaire mindset" revealed! Along with the fundamentals and strategies that you can use right now to create unbelievable wealth and power in your own life! "Hi Bryan, I just finished reading your new ebook 'Money and Power'. It is a wonderful book filled with 'Pure Gold'. If I have to remember only one book that I read in 2002, this has to be the one! I would highly recommend it to anyone." "I remember once when Bryan kindly agreed to answer an interview about his success. He answered it so well. I told him it was wonderful and he replied, "An interview is only as good as the the one who gives the interview." Of course, I glowed with his kind words. Now, it's my turn to tell him that his interview had me reading and savoring every word. It's profound; it's powerful; it's awe inspiring and it's definitely a winner! This interview is not only about making money, but the power within yourself to make a success out of anything that you want in life. When you want to know about how to create your success in not just money, but in anything you want to change or improve, then read this interview. Bryan has asked incredible questions and Allen answers them with his usual no nonsense, no blindfolds, no hidden secrets style! Get it now." Learn the absolute best way to get "buying" traffic to your site. Not just to make your web counter look impressive but to actually make your bank account look impressive! (Nothing comes close to this - not search engines, not pay-per-click sites, nothing!) Also find out what biggest traffic mistake is that almost everyone's making! How a simple yet "shocking" secret can turn your product and business into the only one customers are drawn to! Watch as they are magnetized towards you! Allen has used this strategy to create thousands of lifetime friends and loyal customers! And he continues to do so everyday! The one powerful secret that all the thousands of self-improvement and success books have been trying to tell you. Learn this and your life would be forever changed. All things you desire would be drawn to you effortlessly! People around you would sense some incredible, attractive power about you that they would not be able to explain. And...Find out what worries Allen about the future of online marketing and why it could affect us in a very big and very negative way. Which is all the more reason to hurry up and put this knowledge to use immediately and grab your share of the online fortune - before it's too late! Listen...to be brutally honest with you, this letter does not give the interview the full credit and praise that it deserves. All I can say is, everytime I go through the interview, I get a rush that's indescribable. I can't put it to words. I'm also completely revamping my business strategy, my website and my products (and I'm even making some important changes to other areas of my life) after going through this revealing interview with Allen. Despite the fact that I have spent several years studying the subjects of money, power, and success. I hope that gives you some idea of the magnitude we're dealing with here. The bottom line is...Allen uses these powerful secrets himself. And the results are obvious. He has set himself apart from everyone else! He has made millions of dollars in the process (and continues to do so), and he has customers and members that absolutely love him and are magnetized towards him! That fact alone is all I need to convince me to put this knowledge to use in my own life right now! How about you? Over the Christmas break I was able to finish off your Interview with Allen, and I have to tell you, this is the most inspiring read I've had since Allen wrote Internet Cash Machines. I actually wish I waited until I was home to read this (I was at my Grandma's at the time), because I was so inspired that it hurt not being able to act on the dozens of ideas I had on the way through the Interview. I had to wait until 6 or 7 hours later before I got a chance to do anything about energy and ideas that I had. So for anyone who's considering this book, I would suggest that you tell them to have a pen and paper ready, not to mention be by their computer to act on their inspirations. Also, I wanted to tell you that I love the fact that you were able to "dig up Allen's past." I knew a bit about it from past discussions with Allen, but have always wondered how and where he came from. How he built up the Warriors' site. And where the heck he comes up with these "insanely simple, yet powerfully profitable" systems of getting the word out about his offers. He's always one of the first to spot, or even make a trend, and I'm a sinner for saying, but I envy his ability to do so. Now I have it - "his secret." I actually do some of what he talks about..., but with Allen's added suggestions, this is a can't miss winner. Bottom line, I just wanted to tell you thank you for getting, then publishing this Interview. By far one of the best offers I've jumped on in a long time." As you tear through answer after answer that Allen reveals, you'll begin to understand just how his crazy genius mind works! You'll get a glimpse of a Master at work! Doing what he does best! You'll finally get to see how he creates brand new businesses overnight, and starts making money instantly! You'll learn how he creates an atmosphere and environment around him and his business that his customers just can't get enough of! You'll finally begin to understand the true power that he secretly wields behind his methods. And you know what the best part is? Allen is a master of simplicity and he is great at explaining everything in such a way that anyone can "get it." He explains everything in simple terms so there is no confusion at all! Plus, his writing style is so unique that it will inspire you beyond belief. The message will really sink in! You will want to start putting all this powerful information to use right away! Anyone can take this knowledge and start enjoying incredible success and wealth, very quickly! Success and wealth beyond your wildest dreams! Allen does all of that! Not only does he reveal his most powerful secrets, he does it in such a way that it inspires you beyond belief! You just want to jump out of your chair and go after your dreams! If you've read any of his reports and ebooks before, you probably know what I'm talking about. This interview is so dense with useful information, it's like jamming 5 books into one. This is not like any of the boring interviews you may have read. Nor is this a "one-liner" question & answer interview that you see all over the Internet. Oh no. I have dug deep! And the answers? Man on man, the answers are no one liners either. On almost every question I asked, Allen responded with an entire article! None of this bantering back and forth like you've seen in other interviews. Throw the eBook with Allen away immediately. Burn it. Don't let another person see it. Ever. If anyone is reading this at your site, don't buy the Money and Power eBook. Please. Just spend your money on one of those eBook collections somewhere, but stay away from Bryan's interview with Allen. Why? Because I don't need anymore competition!!! Allen is sharing too much good stuff in there. Way too much. If you're going to sell it, price it at $497.00 or something like that so only a few people buy it. I don't need anymore competition!!! <smile>"
Listen...Get your hands on this interview today! And I would strongly recommend that you read it several times - cover to cover - to really get it all. There's a lot of powerful stuff in it. I pick up more insight and powerful knowledge every time I go through it. I guarantee that you won't be able to sleep at night after reading it just once! I know because that's what I went through! :-) My mind was firing off in 20 different directions over the excitement of all the ways I could use this information and all the things I could do. Talk about putting your mind and your finances into hyperdrive! It's really amazing. I know I can easily sell this for twice or even 3 times as much. So, if I were you, I'd get it right now while I'm still deciding on the price. The Warriors site has been my "secret weapon" for many years. The killer marketing and business information you'll find inside this site is worth thousands of dollars by itself! I really haven't seen anything like it anywhere else on the Internet. And, I have been looking for quite a few years! Classified Magic...82 Pages, E-Book Secrets...468 Pages, Maximum Profits In Minimum Time...104 Pages, The Master Key System...98 Pages, Electronic Publishing 2001...213 Pages, Magnetic Sales Letters...281 Pages, eBay Secrets...154 Pages, Digital Selling Power...203 Pages, 63 Killer Marketing Strategies...117 Pages...Methods of Marketing Masters Seminar Transcripts... Over 600 Pages, The ePublishers Resource Book...283 Pages, The Magic Story...Two parts, Seven Steps To Freedom...172 Pages, Magic Floppy...23 Pages...and thousands more books, articles and reports. And of course, as much as I love this interview, you still get a 100% money-back guarantee if you are not satisfied with what you discover within these pages. So you really have nothing to lose by at least trying this information out risk free. I'm confident that you'll fall in love with it immediately. If for some reason, you don't feel it's worth the price, just let me know and I'll give you a quick refund of your payment. Order now with complete confidence...and change your financial future - and your life - forever! P.S. Remember, you won't find this information anywhere else! A lot of the stuff Allen shares comes straight from his head - created from tests, studies, and in-the-trench work that Allen himself did. (Just read the testimonials on this page and you'll see what I mean.) If you are ready to start creating the kind of life that most people only dream about, this is the product for you! My life is continuing to evolve in ways I can't even describe. And I've only had access to this information for a few short weeks! Get your copy now - absolutely risk free!